Felix Bloch made numerous scientific contributions to twentieth-century physics including Bloch wave functions, Bloch spin waves, Bloch walls, the Bethe-Bloch formula, and the Bloch-Nordsieck theory. His institutional affiliations include University of Leipzig, the European Organization for Nuclear Research (CERN), and Stanford University. October 23, 1905Birth, Zurich (Switzerland). 1928Obtained PhD in physics, University of Leipzig (Universität Leipzig), Leipzig (Germany). 1928 – 1929Assistant in Theoretical Physics to Wolfgang Pauli, ETH Zurich (Eidgenössische Technische Hochschule), Zurich (Switzerland). 1929 – 1930Lorentz Foundation Fellow, University of Utrecht (Rijksuniversiteit te Utrecht). 1930 – 1931Assistant in Theoretical Physics, University of Leipzig (Universität Leipzig), Leipzig (Germany). 1931 – 1932Oersted Foundation Fellow, Institute for Theoretical Physics, Copenhagen (now Niels Bohr institutet). 1932 – 1933Privatdozent, University of Leipzig (Universität Leipzig). 1933 – 1934Rockefeller Foundation Fellow, University of Rome (Università di Roma). 1934 – 1983Acting Associate Professor of Physics (1934-1936); Professor of Physics (1936-1962); Max H. Stein Professor of Physics (1962-1971); and Emeritus Professor of Physics (1971-1983), Stanford University, Stanford (Calif.). 1943Physicist, Manhattan Project, Los Alamos Laboratory, Los Alamos (N.M.). 1943 – 1945Associate Group Leader, Theoretical Division, Harvard Radio Research Laboratory. 1948Member, National Academy of Sciences. 1952Awarded Nobel Prize in Physics with Edward Mills Purcell "for their development of new methods for nuclear magnetic precision measurements and discoveries in connection therewith". 1954 – 1955Director General, European Organization for Nuclear Research (CERN). 1970Elected honorary member, Societe Francaise de Physique. September 10, 1983Death, Zurich (Switzerland). Collaborated on an experiment which led to the first measurement of the magnetic moment of the neutron. PhD advisor at University of Leipzig (Universität Leipzig), Uber die Quantenmechanik der Elektronen in Kristallgittern (on the quantum mechanics of electrons in crystal lattices). Advised by Bloch at Stanford University, Direct Determination of the Magnetic Moment of the Proton in Units of the Nuclear Magneton. Advisor at Federal Institute of Technology, Zurich. Shared the 1952 Nobel Prize "for their development of new methods for nuclear magnetic precision measurements and discoveries in connection therewith." Associate Group Leader, Theoretical Division. Acting Associate Professor of Physics; Professor of Physics; Max H. Stein Professor of Physics; and Emeritus Professor of Physics. Obtained PhD in 1928; Assistant in Theoretical Physics; and Privatdozent. Felix Bloch lecture on the Josephson Effect in a superconducting ring [videorecording], 1971. Felix Bloch scientific correspondence with Niels Bohr, 1931-1955. Niels Bohr Memorial Session [sound recording] / 1963 April 22. Oral history interview with Felix Bloch, 1964 May 14. Oral history interview with Felix Bloch, 1968 August 15. Oral history interview with Felix Bloch, 1981 December 15. 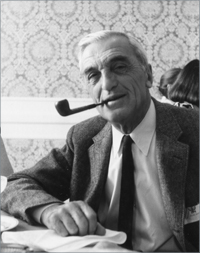 Reminiscences of Felix Bloch : oral history, 1964. Symposium at the 50th anniversary of quantum mechanics [sound recording] / 1976 April 26. AIP Physics Today Division unpublished letters to the editors, 1972-1983. Bloch symposium: a Stanford centennial symposium celebrating the work of Felix Bloch [video recording], 1989. Conversation with Alan Herries Wilson [sound recording], 1974 November 9. David B. Nicodemus papers, 1945-1989 (1945-1960 bulk). Excerpts from a Georgetown University Summer School course on the science and technology of superconductivity [videorecording] / recorded by Georgetown University ; 1971. H. B. G. Casimir papers, 1929-2000. Henry Cutler Torrey papers, 1935-1976. I. I. Rabi papers, 1899-1989 (bulk 1945-1968). In private hands. Contact Tamm family. Ivar Waller papers, circa 1912-1989. J. Robert Oppenheimer papers, 1921-1980 (bulk 1947-1967). Melba Phillips response to early 1930s Ph.D.s Survey, 1978. Oral history interview with Carl Friedrich Weizsacker, 1978 April 18. Oral history interview with Cornelis Jacobus Gorter, 1962 November 13. Oral history interview with David Locke Webster, 1964 May 21. Oral history interview with Edward Mills Purcell, 1977 June 8 and 14. Oral history interview with Eugene Paul Wigner, 1981 January 24. Oral history interview with John R. Woodyard, 1974 October 18 and 1975 December 17. Oral history interview with John R. Woodyard: Cyclotron and Klystron development: oral history transcript, 1974 October 18 and 1975 December 17. Oral history interview with Lothar Wolfgang Nordheim, 1977 July 24. Oral history interview with Luigi Giulotto, 1982 December 7. Oral history interview with Nicolaas Bloembergen, 1983 June 27. Oral history interview with Norman Ramsey, 1960 July 19 to August 4. Oral history interview with Rudolf Ernst Peierls, 1977 May 20. Oral history interview with Rudolf Ernst Peierls, 1981 May 13 and July. Oral history interview with Stefan Rozental, 1971 August 27. Oral history interview with William Conyers Herring, 1974 July 23, 29, and 31 October. Oral history interview with Wolfgang Kurt Hermann Panofsky, 1973 May 15 and 1974 March 6 and June 3. Stanford University Department of Physics records, 1966-1985 (bulk 1971-1985). Fundamentals of statistical mechanics : manuscript and notes of Felix Bloch / prepared by John Dirk Walecka. Molekulartheorie des mangetismus / von Felix Bloch. Theorien des Aufbaues der Materie / von H. A. Kramers. Felix Bloch and twentieth-century physics : dedicated to Felix Bloch on the occasion of his seventy-fifth birthday / M. Chodorow ... [et al. ], editors. Felix Bloch Physics Today obituary. Oral history interview with John D. Roberts, 2007 July 27. The pioneers of NMR and magnetic resonance in medicine : the story of MRI / James Mattson and Merrill Simon.